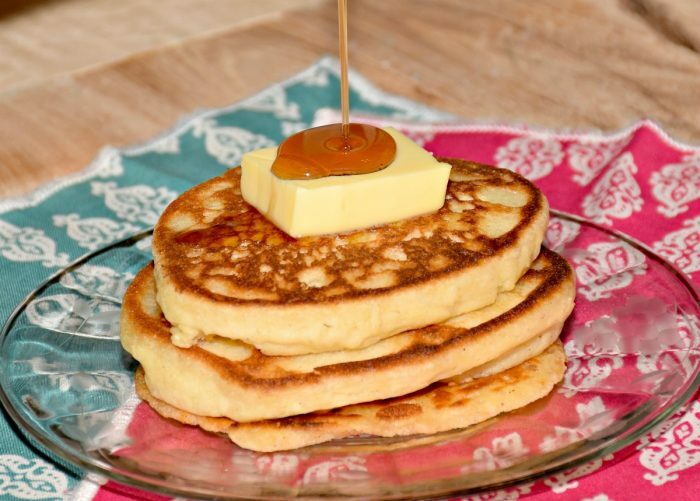 There’s nothing quite like a stack of fresh pancakes with syrup drizzling down the sides! And these gluten free pancakes are so good you won’t even miss the wheat! When I was a child, our family was invited over for dinner at a neighbor’s place. After dinner we rode with them to collect buckets of sap from their sugar maples. Then we went to their garage and watched as the sap cooked down into syrup. Funny how memories fog up over time. I cannot remember exactly how the cook-vats were set up, or how they stirred them or any of those details, but I will never forget tasting the sap at different stages as it cooked down. Nor will I forget the sweet smoky smell that resulted from the maple syrup making process. To this day we still use real maple syrup. It’s just a thing. 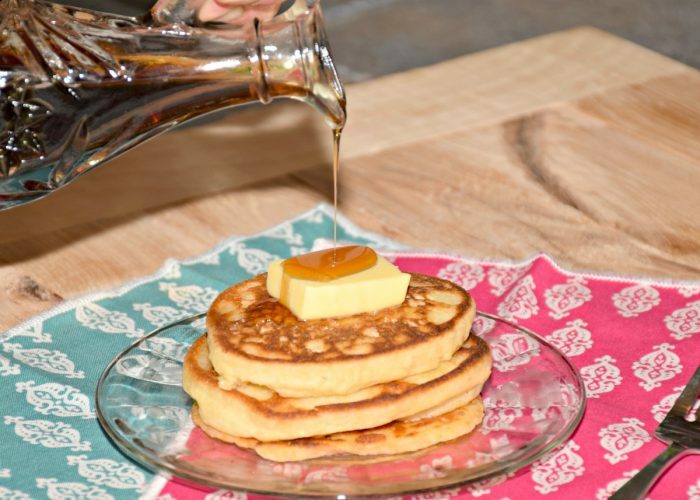 Maple syrup and pancakes is not a breakfast food around here, it’s a very popular dinner instead! Just the other night as we were enjoying our pancake dinner, Jason turned to me and made this comment, “I’m not sure if I’m just getting used to them, or you’re getting better at making them, but these gluten free pancakes are pretty good!“. Well, I’ll take that compliment! Gluten free pancakes ARE good once you have the right recipe! 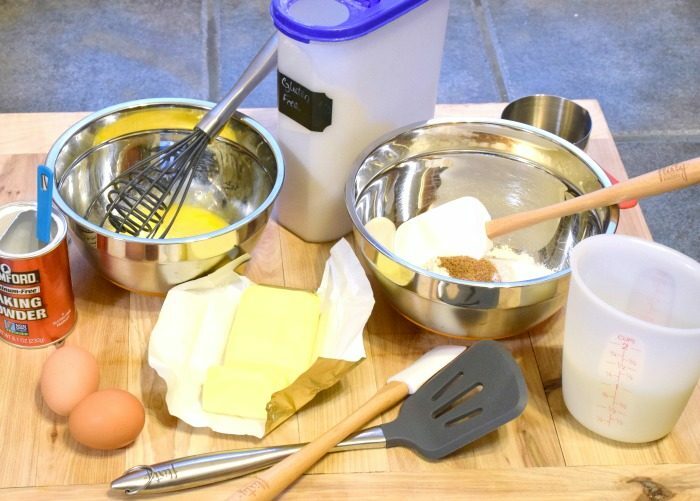 So today I want to share with you my recipe for gluten free pancakes. 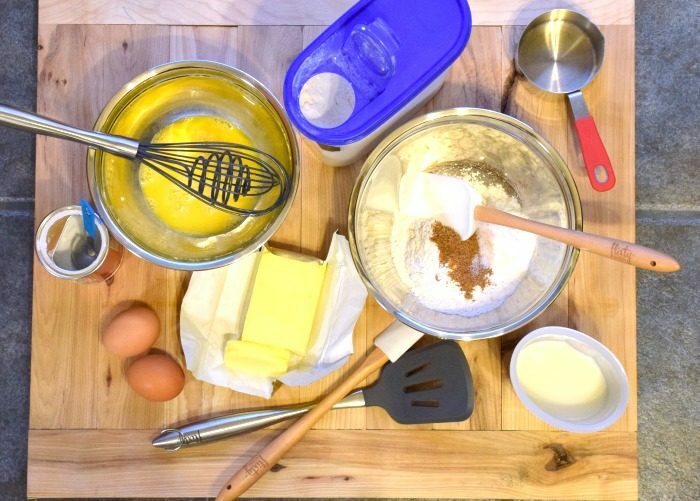 This recipe and post is featuring cooking essentials from the NEW Flirty Kitchens Store! 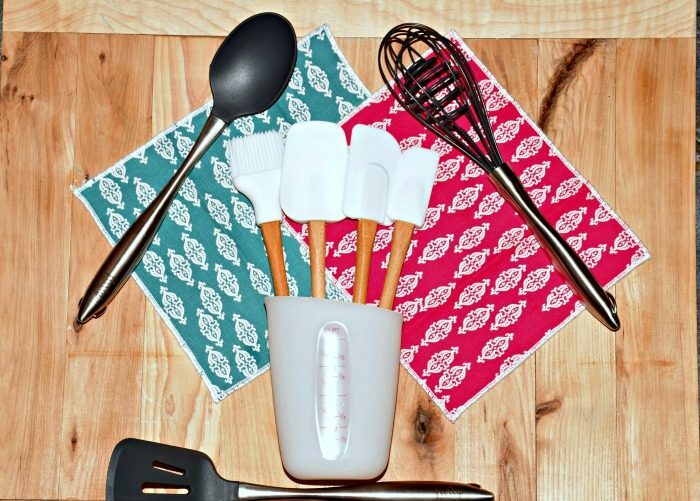 Longtime readers will remember how much I love the aprons from Flirty Aprons, and now they have a kitchen essentials section called Flirty Kitchens! I was sent a few products to review, and best of all, I was sent a promo-code for flirty aprons to share with you! Whoo-Hoooo! I’ll give you the code at the end of this post so keep reading! 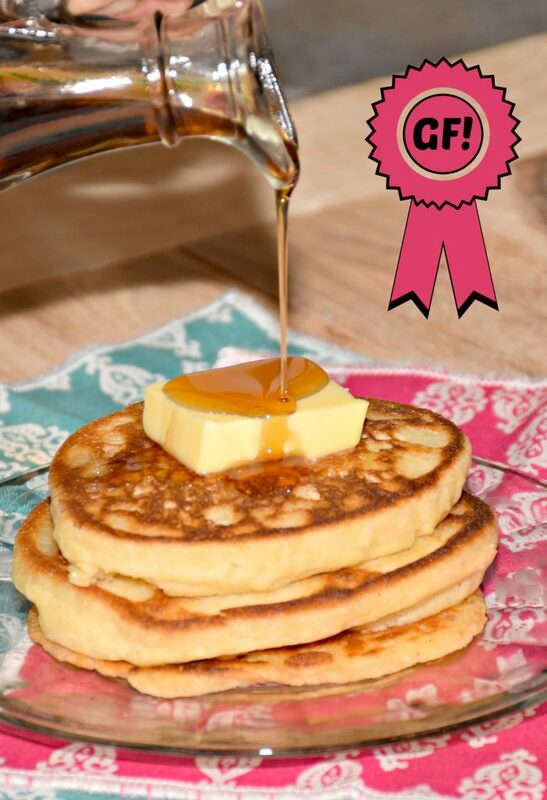 Gluten Free Pancakes and Flirty Kitchens - Say What?! 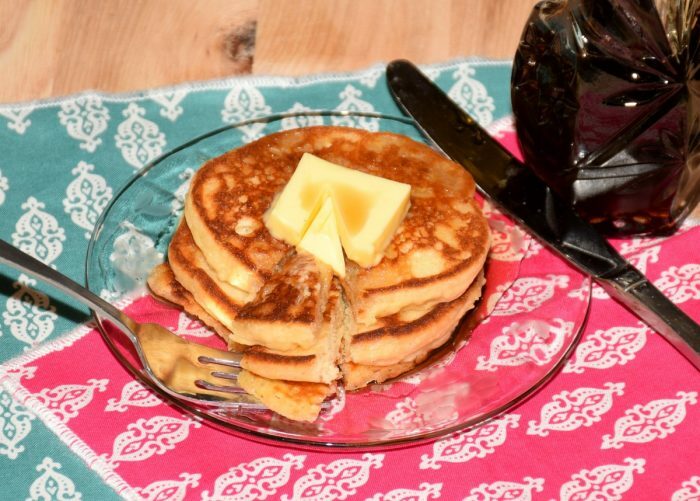 Fast and easy gluten free pancakes are for more than just breakfast. I often make a recipe of these and serve as a fast and easy dinner! Sift gluten free flour mix, baking powder, sugar and salt together in a medium bowl. In a small bowl, whisk the eggs and milk, briskly stir in the melted butter. Pour egg mixture into the flour mix and stir briefly but well. Cook until pancakes are puffed, dry around the edges and bubbled in the center. Flip and cook other side until golden brown. Remove. Add oil to your skillet each time you add more pancake batter. So what’s the deal with Flirty Kitchens? Flirty Kitchens is the newest component of Flirty Aprons and features such cooking essentials as stainless steel mixing bowls, measuring cups and spoons, as well as silicone measuring cups, spatulas and more! If you are looking to replace your cheap plastic mixing bowls and kitchen tools with something considerably nicer, definitely check out the high quality products that Flirty Kitchens offer! The silicone spatulas are my favorites to be honest! The handles are so sturdy and the silicone spatula itself seems to be adhered very well. I’ve had issues in the past with my cheaper spatulas where the head falls off the handle and I’m not kidding when I say it’s a mess! I’m excited about these sturdy spatulas for sure! My next fave is that whisk. It has a dual action design that really beats eggs quickly. It’s also coated in silicone so safe for nonstick surfaces. Finally the silicone flexible measuring cup… It’s interesting, and different… But I don’t hate it at all. 🙂 In fact, I’m pretty impressed with it and like that it’s not going to break if my kids drop it (they drop and break everything it seems!). I’m excited to have some nice new sturdy cooking tools in my kitchen.And equally excited to get rid of the junky things I no longer need! Remember, these don’t last long! Don’t forget to use code Wife40 for 40% off your purchase! Another way to make fluffy pancakes is to seperate the eggs. Beat the egg whites until they stand up. Then after you batter is made you can fold in the egg whites. That will make your pancakes fluffy. These look delicious, and are the perfect idea for dinner tonight! Thanks Kendra! Kendra, do you use the 1 to 1 baking mix from Bob’s Red Mill for these? They look amazing! Yes! That is exactly what I use. They are fantastic! Gosh, we love pancakes and these are making me want them right now! Thanks for sharing this recipe with us at Funtastic Friday! We love eating breakfast items for dinner. My kids aren’t allergic to gluten, but I know someone I can pass this recipe to that needs to eat gluten free. Thanks for sharing on Merry Monday.